Paramount Release A New Poster for 'MISSION IMPOSSIBLE: GHOST PROTOCOL'! A new poster has been unveiled for the fourth movie in the 'Mission Impossible' franchise; Mission: Impossible – Ghost Protocol. The movie, directed by Brad Bird & produced by J.J. Abrams stars Tom Cruise, Jeremy Renner, Ving Rhames, Josh Holloway, Paula Patton, Simon Pegg, Vladimir Mashkov, Anil Kapoor, Léa Seydoux, Tom Wilkinson & Michael Nyqvist in another impossible mission which surely by their previous success rate should now be renamed mission improbable. But this is not just another mission. [Thats a lie right there!] The IMF is shut down when it’s implicated in a global terrorist bombing plot. 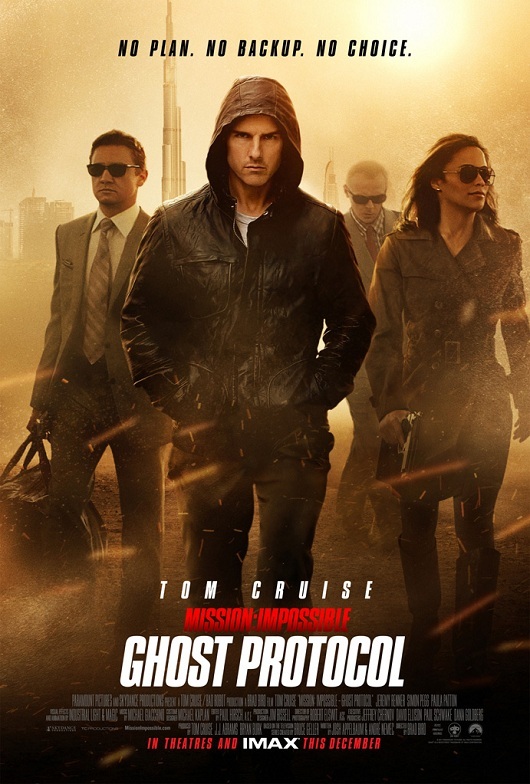 Ghost Protocol is initiated & Ethan Hunt [Cruise] & his rogue new team must go undercover to clear their organization’s name. No help, no contact, off the grid. You have never seen a mission grittier and more intense than this. Mission: Impossible – Ghost Protocol hits theaters this December 16th in the US & December 26th in the UK. I'm reading: Paramount Release A New Poster for 'MISSION IMPOSSIBLE: GHOST PROTOCOL'!Tweet this!